In years gone by, the term micro rc airplanes didn't exist. In fact, when I was a kid flying my little rubber-powered planes around the field behind my parents' house, waaay back in the 1980s, the thought of a plane of that size being radio controlled was an impossible dream! As time went by, so the occasional small rc plane cropped up here and there - a home-grown effort by some clever aeromodeller who had managed to achieve the dream - but they were very rare. The first one I remember seeing was a scratch-built plane with control to rudder and elevator. It was at an indoor flying meeting, and I remember being in awe at this guy controlling his plane around the chaos of all our free-flight models! Things have changed big-time, in the last couple of decades, and thanks to the major electronic advancements made in recent years, micro rc airplanes are now commonplace. And they're not just one or 2-channel rc planes - they are 3, 4 or even 5-channel ones. They can be trainers, 3D-capable aerobats, and jets! Even multi-engine micro planes can be readily bought these days. Micro marvels for the masses! Several manufacturers have successfully produced micro rc airplanes over the years, but it's the North American radio control giant Horizon Hobby that has really won the battle. Horizon has released micro planes under their Parkzone, HobbyZone and E-flite brands which have sold in their thousands. The aircraft all have the UMX prefix, which stands for Ultra Micro Extreme. with micro rc airplanes over the years. Such micro planes are of foam construction and are mainly sold as Ready To Fly (RTF) packages, although Bind-N-Fly (BNF) ones are available for intermediate rc pilots who already have their own transmitter. 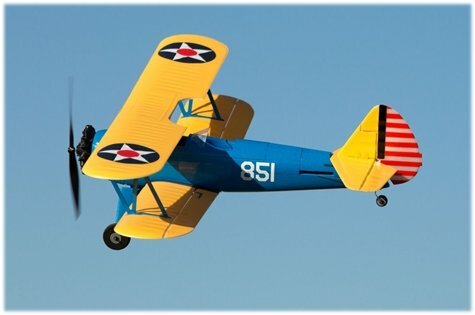 The planes vary around the 16-inch wingspan mark and are small enough to be sold fully assembled in a sturdy box, which also doubles up as a handy box to store and transport the plane. The aircraft are very widely available now and typically cost around $100 or so, making them very affordable. The choice of aircraft - both scale and non-scale - continues to grow and as an enthusiastic rc flyer, it's difficult to resist the temptation to buy one of each! Shop for UMX micro RC airplanes. Are micro RC planes for beginners? Well, the short answer is yes and no! The HobbyZone Champ , shown below, has been a massive seller for beginners and many members of my forum cut their teeth on one of these little 3-channel micro rc planes. The Champ is loosely based on the full size Aeronca Champion and its high-wing design makes it nice and stable in the air - great for beginners. It's sold, as many micro planes are, as an RTF package so everything you need is in the box, and it's very affordable which is always good when you're entering a new hobby! And, as previously mentioned, they come in a very handy carry-box, so such micro planes have a great 'convenience factor'. Another good thing about learning to fly with a plane this size is that its low mass means that it is less likely to suffer badly in a crash. Of course, damage can happen in any crash, but micro rc airplanes really don't have much inertia and so carry little momentum. So when they do crash they have a good chance of bouncing rather than breaking (with any luck). Furthermore, small rc planes can be flown in smaller areas which is handy if your flying area is limited in size. The first is that a larger plane is easier to see (kind of obvious, that one!). When you're learning to fly rc, you don't want to be flying your plane too close to you, and the bigger it is the further away it can be from you without causing too many disorientation issues. A micro rc plane gets very small very quickly once you start flying it away from you, and that can lead to all sorts of problems. The second reason is that a larger rc plane is heavier, and that extra mass means the plane will be more stable in the air. In other words, it won't be so adversely effected by wind gusts and the like. The ongoing technological revolution has done the radio control flying hobby lots of favours over recent years. Electrical components that were once hard, if not impossible, to source are now widely available. 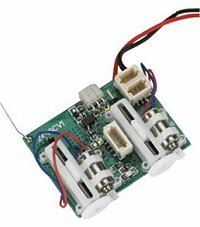 And the nature of such components necessary for a micro rc airplane has changed too - where before a separate receiver, speed control and servos were needed now we can buy a tiny PCB that's home to everything! Spektrum's AR6400 series of receiver/ESC/servo units (shown right) has long led the way in affordable micro rc airplane technology, the selection available means that there's a unit for every type of micro plane. An alternative option to buying the component new is to buy a second hand Ultra Micro rc airplane and use it as a donor plane - strip out the electronics, including the motor, and you've got yourself a real bargain. 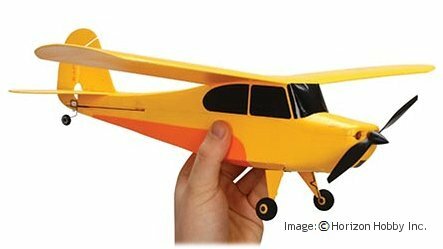 Indeed, there are now balsa kits of indoor rc airplanes that have been designed around the Spektrum components, and you're expected to use a donor foam RTF micro plane for the necessary electronics. But, getting back to the aforementioned wind gusts, there has been a notable development in micro rc airplane technology, and that's the auto-stabilisation technology. Again, Horizon Hobby have led the way here with their AS3X™ technology that is now integrated into most of their UMX planes. AS3X stands for 'Artificial Stabilisation, 3-Axis' and works by dampening out any control surface fluctuations caused by, primarily, wind gusts. It doesn't interfere with the pilot's control inputs, but it does continually work to reduce the effect of wind gusts on the plane. The end result is much smoother flight characteristics, more resembling those of a larger, heavier plane. A micro rc airplane without such technology (and Horizon's AS3X isn't the only one out there) will be more twitchy and adversely effected by the wind, to the point that such planes can't really be flown comfortably in any wind stronger than, say 5mph or so. 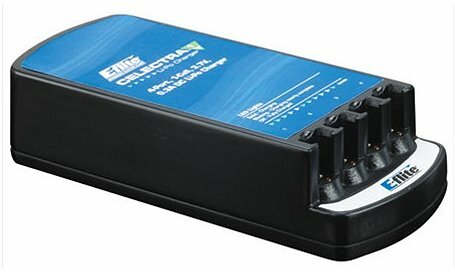 For motor power, micro rc airplanes commonly use a single (1S) Li-Po cell such as the one shown to the right. These have been adopted by the majority of manufacturers producing micro rc aircraft (planes and helicopters) and although the capacity is understandably small, typically less than 200mAh, the light weight of a typical foam micro plane means that flight times of up to ten minutes are still achievable with careful flying. So, hopefully you now know a bit more about micro rc airplanes than you did at the start of this page. Such planes certainly are worth considering, especially if your budget is tight and if your flying area is small. Their size makes them the perfect answer if your flying area is limited in size, or if you want to try your hand at indoor flying. Indoor rc airplanes / flying.